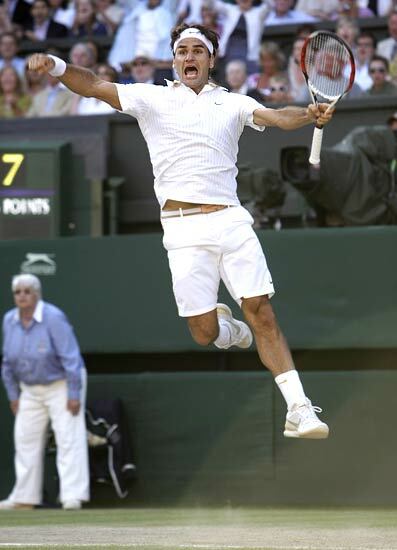 Switzerland's Roger Federer beat Andy Roddick in one of the most extraordinary finals ever seen at Wimbledon on Sunday, holding off an incredible challenge from the American to win 5-7, 7-6, 7-6, 3-6, 16-14. 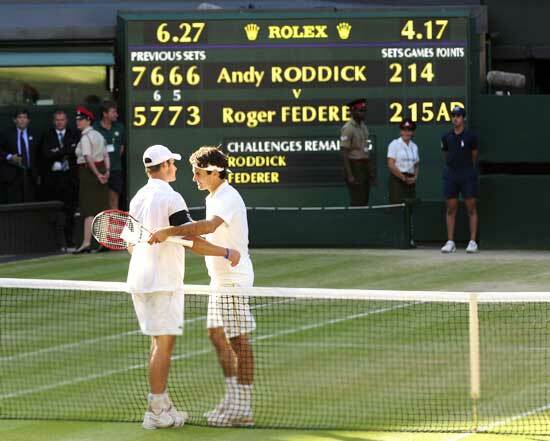 The final set alone of an unforgettable Centre Court duel lasted 95 minutes before Roddick's mishit forehand gave Federer his sixth Wimbledon title and the record of 15 Grand Slam titles he so cherished. 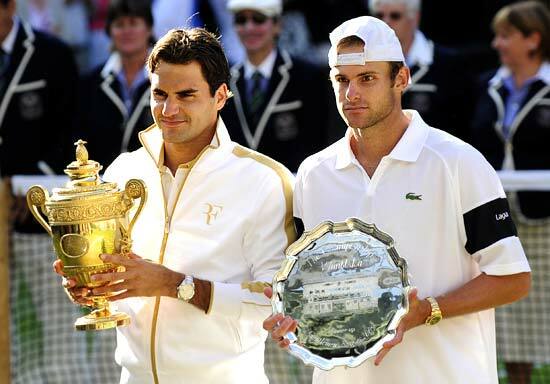 "Andy I want to say you're going to come back and win one, I'm sure," Federer said on court as a shattered Roddick contemplated his third defeat to Federer in a Wimbledon final. "Today I was on the lucky side. It feels funny to have the trophy back. It feels great. It was a crazy match, my head's still spinning. It's an unbelievable moment in my career." "It's not really one of those goals you set as a little boy but, man, it's been quite a career," Federer, who pulled on a white tracksuit top with the number 15 emblazoned on the back, said on court after lifting the Challenge Trophy for a sixth time, 12 months after being beaten by Rafael Nadal here. "It feels amazing but this is not why I am playing tennis for, to break all these records but it is definitely one of the greatest ones to have. "This year's crazy, I told you. Things didn't look so good when I lost in the final of the Australian Open, which was still an unbelievable result. "To come through and battle back and win Paris and now Wimbledon back-to-back, something Bjorn (Borg) did a couple of times, it's amazing." A year ago, Federer's five-year reign at Wimbledon was ended by Nadal, he then hit back to win a fifth consecutive US Open then in February he lost again to Nadal in the Australian Open when he broke down in tears. 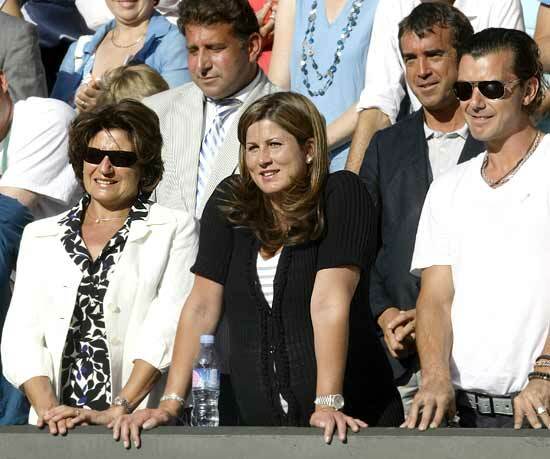 After marrying long-time girlfriend Mirka in April he finally ended years of near misses at Roland Garros. 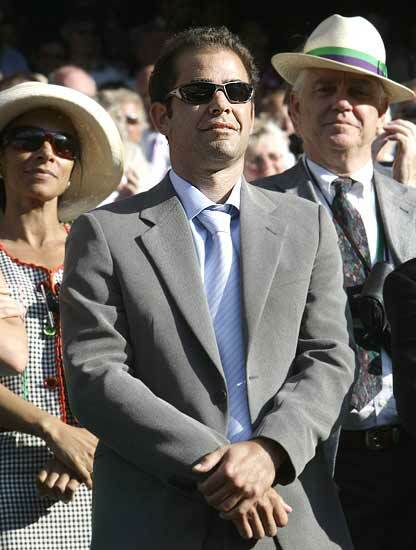 A jetlagged Pete Sampras paid a surprise first visit to Wimbledon for seven years to watch Federer overtake his record for grand slam wins, and then hailed the Swiss as the game's best-ever player. Federer's exhausting five-set victory gave him his 15th Grand Slam title, against 14 for Sampras, and the American said the Swiss had settled the debate about the game's greatest. "The critics say (Rod) Laver, and (Rafa) Nadal beat him a few times in majors, but he's won all the majors, he's going to win a few more here, so in my book he is. "Roger's a friend, he's a great player, he's a good guy. He's got 15 now, he can get 17 or 18 majors. If he just keeps it going and stays healthy, he could go to 18, 19, actually. "The guy's a legend and now he's an icon. He's got 15 majors, that's a lot of majors, that's a lot of work. He's a credit to the game." 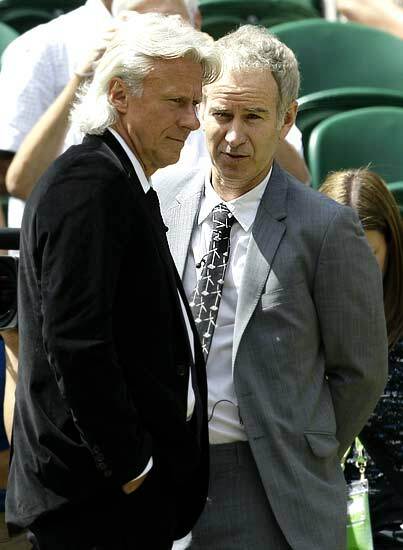 Borg, who managed five Wimbledon singles triumphs was sat alongside Sampras, who has seven, and four-times winner Rod Laver as Federer finally overcame the gallant Roddick. "Thanks very much for coming," Federer said to California-based Sampras. "I know it's a long way but you know you are a member we like to see you here and it's such a pleasure to play in front of such great legends. "I was here last year and I didn't have it (the trophy) but it feels great. It was a crazy match and it was an unbelievable end. My head's still spinning, it's an unbelievable moment."